Ernie's on the Lake is located on the Emerald Point Marina grounds on Lake Travis. Since we re-branded in early 2017, we've worked hard to create a menu that is fun, incorporating the lake and party vibe into our selections. Being the former Carlos n' Charlies - we have a lot to live up to... and we're working hard to make Ernie's on the Lake the "go-to" place on Lake Travis. The multi-level restaurant, bar and music venue offers the choice to observe the waters from our decks or within our glass-enclosed restaurant. Are you coming by boat? If so, we have many courtesy docks available to make your visit to Ernie's on the Lake as easy from the water as it is from land. A casual, outdoor venue, Shack 512 offers spectacular panoramic views of Lake Travis and the surrounding hills. Accessible by land or by lake, we welcome boaters and have plenty of public boat parking next to the Sandy Creek Yacht Club. Located in rustic Volente, TX Shack 512 is just a short, scenic drive outside of Austin. Briarcliff Marina is located at Mile Marker 26 and is open 24 hours a day 7 days a week. 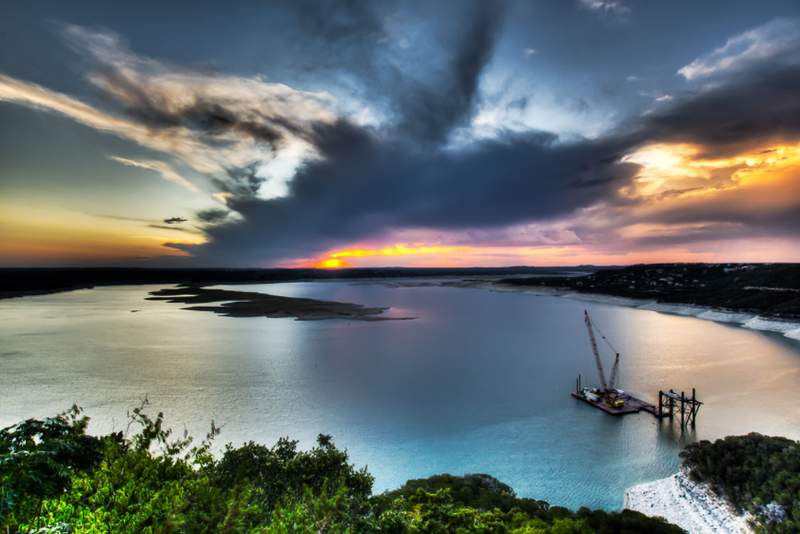 Tucked deep in the heart of Lakeway and perched above the Rough Hollow Yacht club, Canyon Grille Rough Hollow offers fantastic eats paired with extraordinary views of Lake Travis, breathtaking Hill Country sunsets and plenty of live music. Lakehouse Cafe is located a Mile Marker 26 just above the Briarcliff Marina. The restaurant is a favorite of locals and visitors for its picturesque views of Lake Travis. This is Lake Travis' entertainment headquarters. they offer waterside dining for both lunch and dinner, a full bar, livemusic and a sand volleyball court. Come experience the excellent service, food, and fun that makes the legend what it is...Carlos'N Charlie's. Located only about 3-5 min via boat from the Freedom Boat Club Location on Lake Travis. The Gnarly Gar on Lake Travis is a floating restaurant, bar and live music venue on the north shore of Lake Travis. The enormous catfish that gather around the deck begging for food are a local favorite and tourist attraction. The Gnarly Gar Ship Store & Fuel Dock offers a variety of items ranging from boat supplies to beer and wine to go. With plenty of boat slips, a fantastic view and it's casual and relaxed atmosphere, The Gnarly Gar on Lake Travis is a great destination!